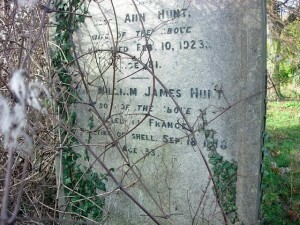 William James Hunt was born in 1885 to William Hunt and Ann Hunt (nee Condor.) His father worked as a college servant, but William James Hunt became a grocer’s assistant by 1901. The family initially lived on Christ’s Lane, but by 1911 he, his widowed mother, and a spinster aunt, were living at 35 Earl Street. He continued to work as a grocer’s assistant until enlisting in the British Army, during the First World War. His battalion went to France in 1915, though it is not clear when he enlisted. He died on the Western Front from shell fire on September 18, 1918.